Castle cleaning professional Upholstery cleaner Kent covering Maidstone & Medway, Tonbridge & Tunbridge wells, Sevenoaks & Orpington, Ashford & Canterbury, Thanet and Folkestone. At Castle Cleaning we only use the very best and latest upholstery cleaning equipment. Most people never clean their upholstery. Not even with a quick vacuum. 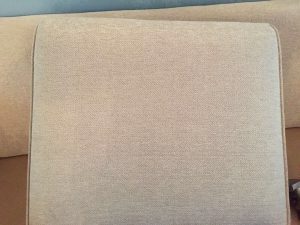 Is this how to treat your upholstery? You are sitting on dirt, dust, sand, grit, dust mites and many other pollutants. Protect your investment and have your upholstery professionally cleaned. Our upholstery cleaning services employs the latest cleaning chemical technology which is 100% biodegradable. 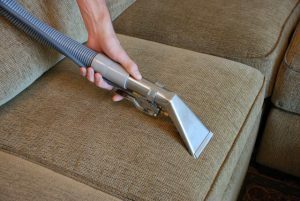 Our upholstery cleaning machinery is powerful and effective at removing dirt and grease adhered to your fabrics. Our staff have been trained by the IICRC to give the best Upholstery Cleaners you can trust. For both homes and business, we pride ourselves in providing a cost effective upholstery cleaning service. Our prices are highly competitive and reasonable compared to others in our sector. Our upholstery cleaners take the time needed to clean every square inch of your furniture to remove as much dirt as possible. We tackle all types of stains and spots and using our thorough upholstery cleaning process to give you the cleanest and best results possible. Whereas most carpet cleaners try and clean upholstery the way they clean carpets i.e. injecting hot water down and into the cushion. 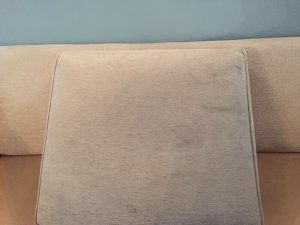 At Castle Cleaning we believe this can over-wet the upholstery, we use a Fiber dry shampoo extraction method which keeps the moisture levels to an absolute minimum but still delivers amazing results. As you see below. For high quality cleaning of your chairs, sofas, settees couches, cushions and other upholstery, contact dean@castle-cleaning.co.uk. How often a home is cleaned is an entirely personal decision, made by each individual, taking into consideration of the needs of their home and family. When it comes to cleaning carpets, soft furnishings and upholstery, it is often when things start to look grubby that the decision is made to get them cleaned. However cleaning for cleaning sakes is only one opinion. Regular cleaning will aid removal of unseen pollutants and allergens, and will help to prolong the life of carpets and furnishings. The decision as to just how often these items are cleaned should depend on factors such as the number of people living in the home, whether pets are present, or if the occupants live in smoke or high pollutions areas. The choice of when to clean can be judged in terms of both health and apparent cleanliness. A good question to ask is how often do you clean your bed linen? Do you lie on your sofa as much as you take to your bed? Does once a year seem excessive now?